In 1982 against the Cowboys, Bill Walsh called the play, a pass from Montana to Clark in the end zone that is historically called THE CATCH. 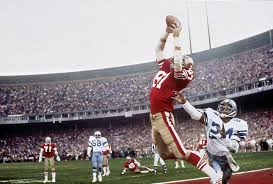 Dwight Clark, the receiver of THE CATCH, has died at the age of 61, of ALS. He will always be remembered as one of the heroes of the 49ers.